Well, O.K., I am not exactly working on the beach. 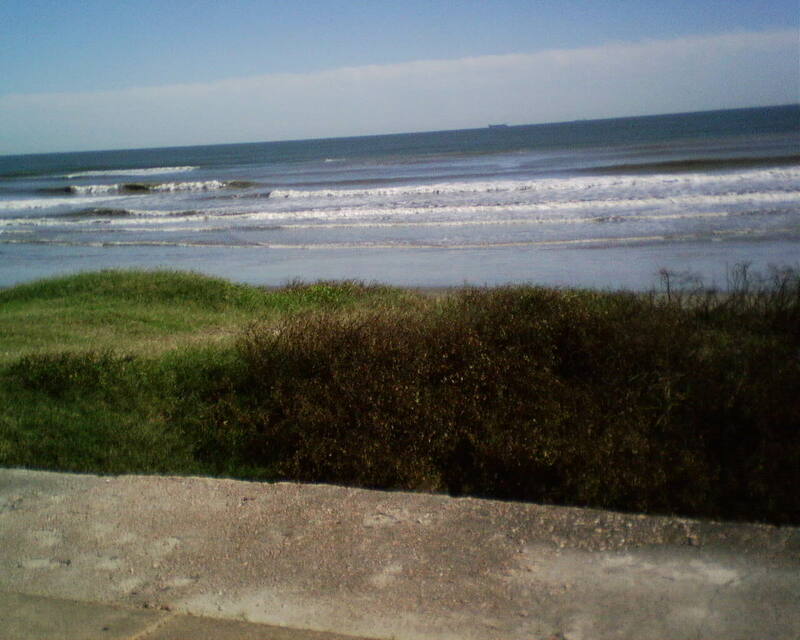 But the home in Galveston where I am working today is just a few minute’s walk away. It was a beautiful day – uncharacteristically bright and clear, and even though I spent the day hanging wallpaper in the upstairs bathroom, I had an open window to look out, and thoroughly enjoyed myself. 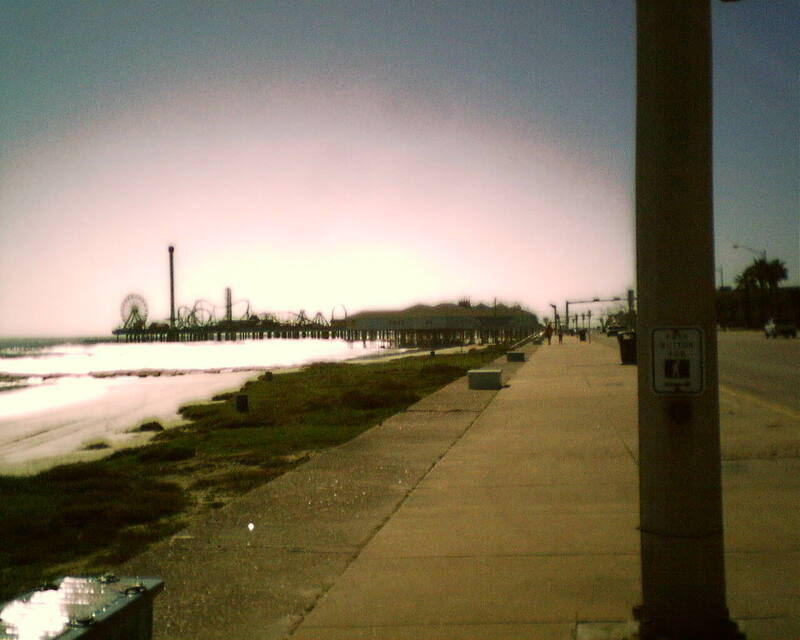 The amusement park is Galveston’s Pleasure Pier, built after Hurricane Ike destroyed other facilities, and the grand building is the historic Galvez Hotel, which has withstood two hurricanes and is still lovely and going strong. Out of the ’90’s, and Into the …. 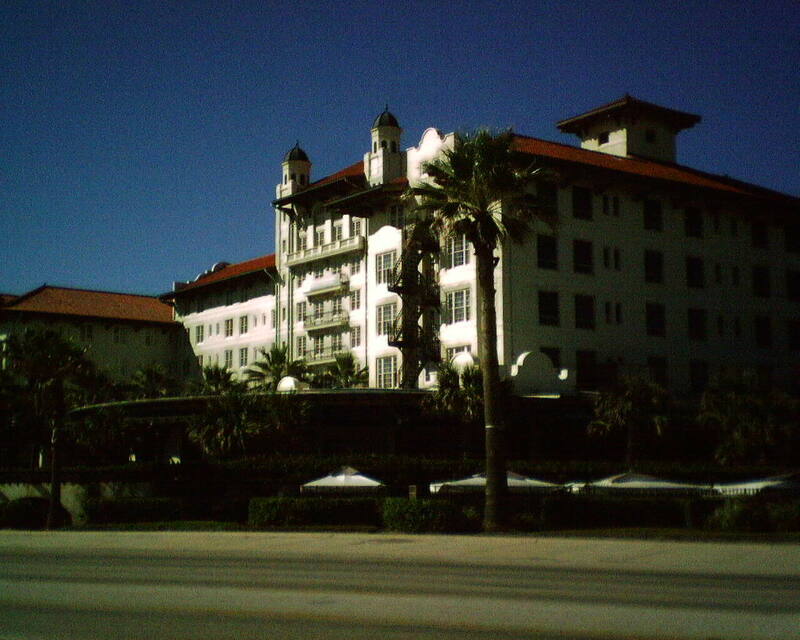 ’90’s …. The owners of this newish home in Garden Oaks were updating their powder room, including a new console style vanity, a point-of-use tankless water heater, and new wallpaper. They wanted it all done before the Super Bowl game…. I am generally booked with work several weeks out, but had an unexpected opening, so was able to squeeze them in today, between Christmas and New Year’s. They were happy to let me come this holiday week! 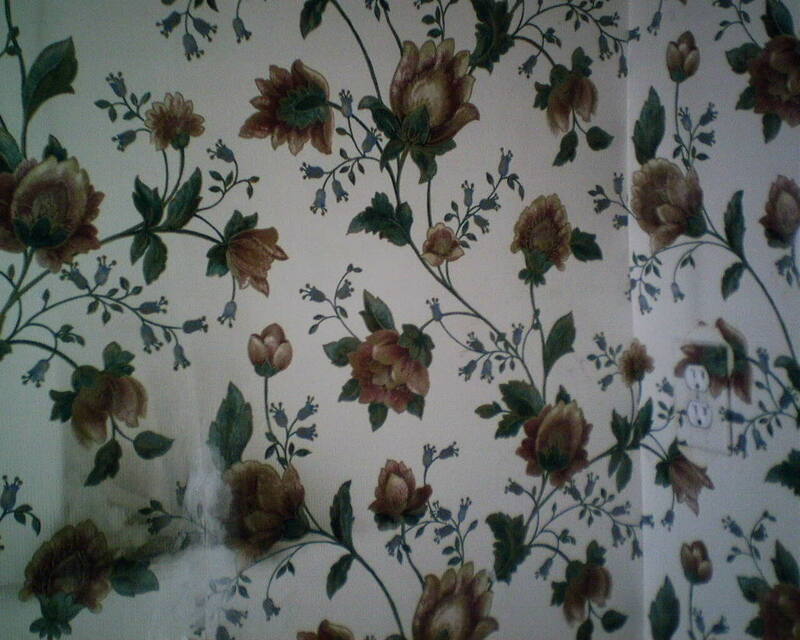 I have hung a ton of that chintz style floral (top photo) in the ’90’s. It’s a pleasing pattern, but has become dated. Really, the homeowners’ new choice isn’t much different, but it’s an updated version, plus the red color has a lot of impact, and that helps the walls stand out against the white woodwork. 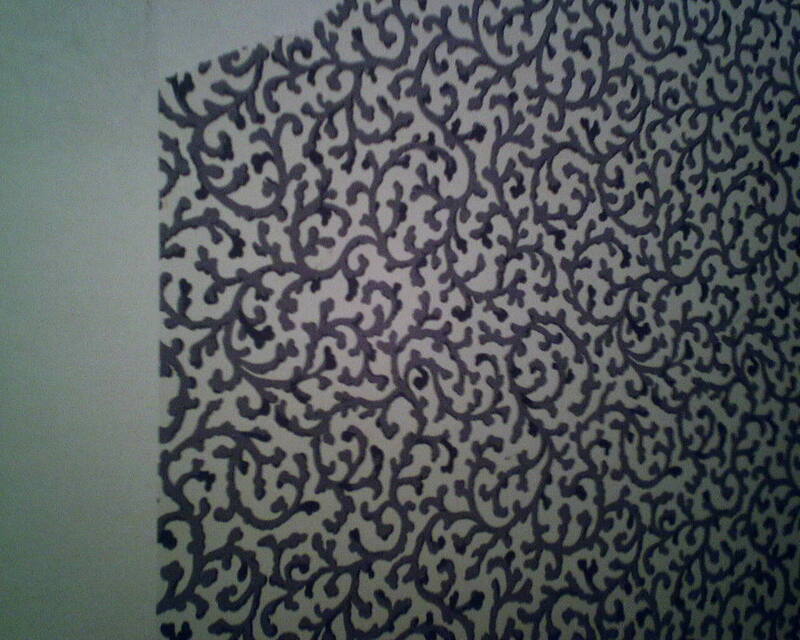 One good thing about a pattern like this is that it won’t really ever go out of style. All that said, the room looked great when I was finished, and the homeowners loved it. The plumber is coming tomorrow, to install the sink, and they will be all ready for Super Bowl Sunday! 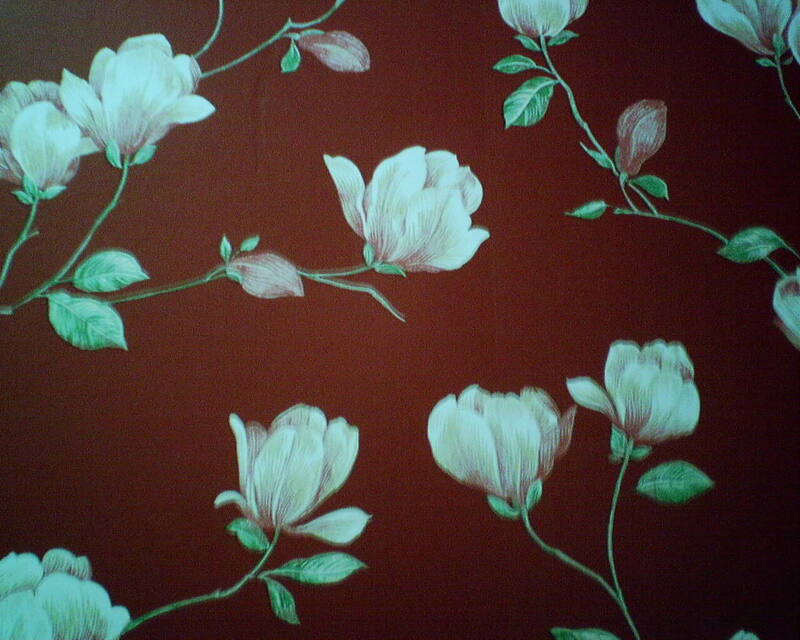 This wallpaper was bought from the Sherwin-Williams on N. Shepherd in Garden Oaks. 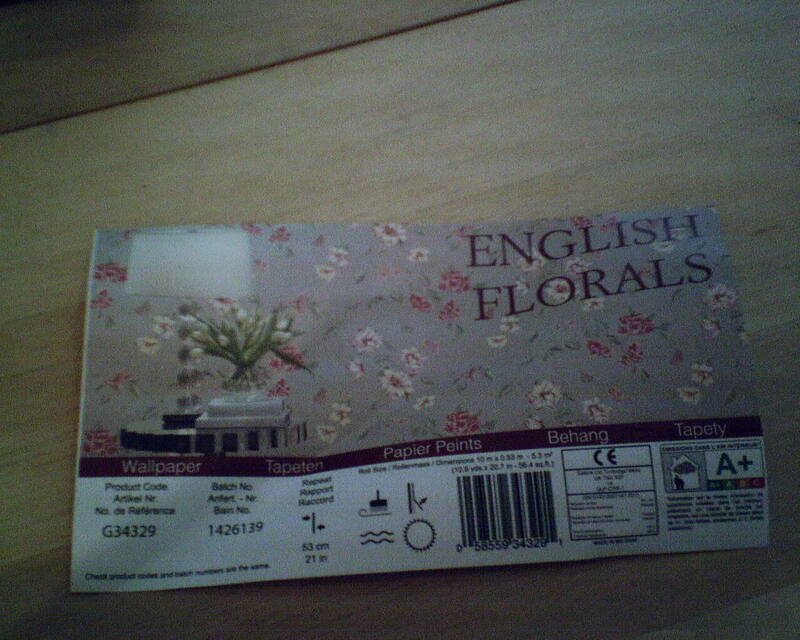 I believe it was made in England, and the brand appears to be English Florals. 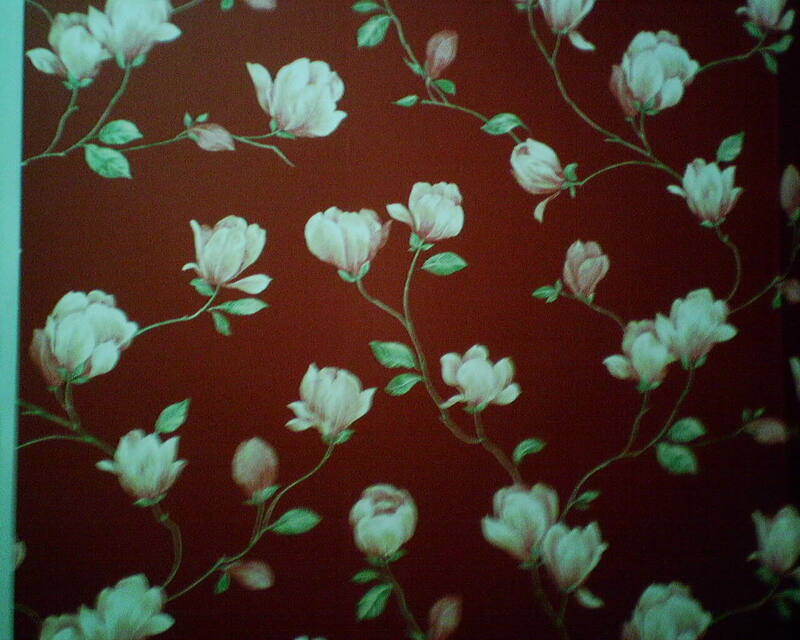 These days, I am hanging wallpaper in lots of new homes, which have never had wallpaper before. So today, when I had to strip off existing paper before I could hang the new, it was like a step back in time. And, since the first installer had skipped an essential step, it was a long step! The navy-blue-on-white savoy pattern (Photo 1) was a nice paper that had been hung, unfortunately, directly on new Sheetrock, without a wallcovering primer, nor even a coat of paint. In this setting, most wallpapers will bond with the drywall, and can be very difficult to get off. 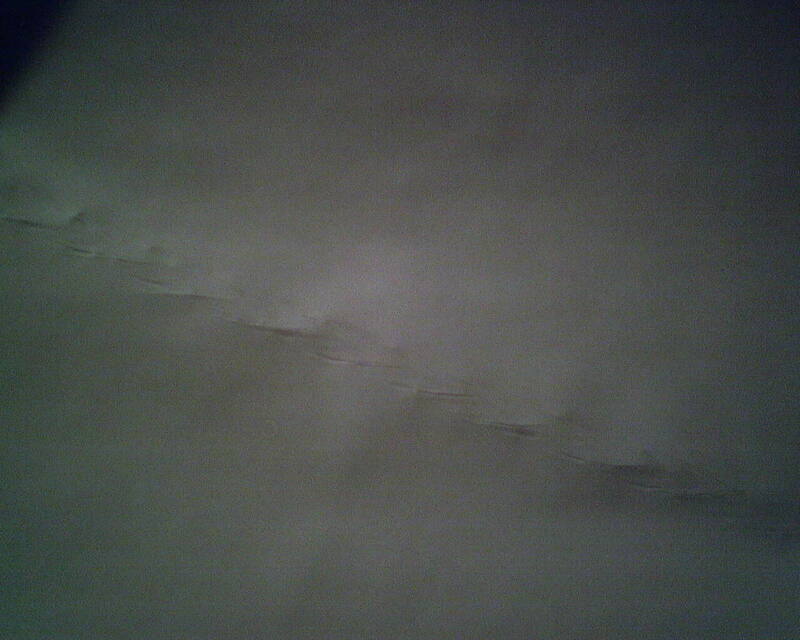 Going too fast, or trying to force the paper to succumb to you, can severely damage the walls. To avoid this, I do it in steps. The first step is to wet all the wallpaper with a damp sponge. That seems to strengthen the top layer of paper. Second, I strip off the top, inked / colored layer of paper. This leaves the backing / substrate – which in my photos today is a white paper. This white backing layer must then be soaked with a wet sponge. Unlike the top, colored layer of paper, which has a thin vinyl coating, this white backing layer can be penetrated by water. Once the water soaks in, the paste beneath it is reactivated. 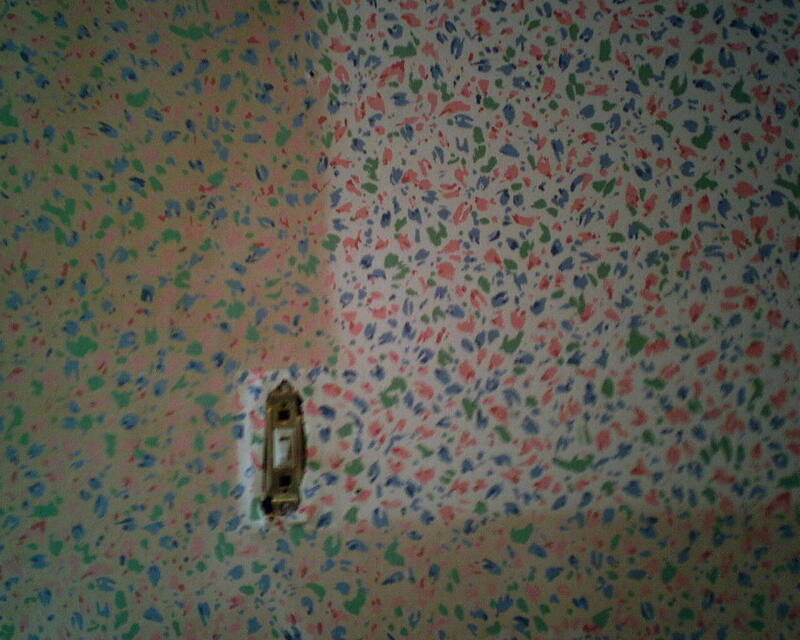 And once enough time has gone by and that paste is wet enough, the wallpaper can be removed. If you are lucky, it will peel away easily. More likely, you will have to use a stiff 3″ putty knife to carefully scrape every inch of wallpaper backing away from the wall. If you are lucky, it will come away with no damage to the Sheetrock. More typically, you will have some tears, and will have to do some repair work to the drywall. 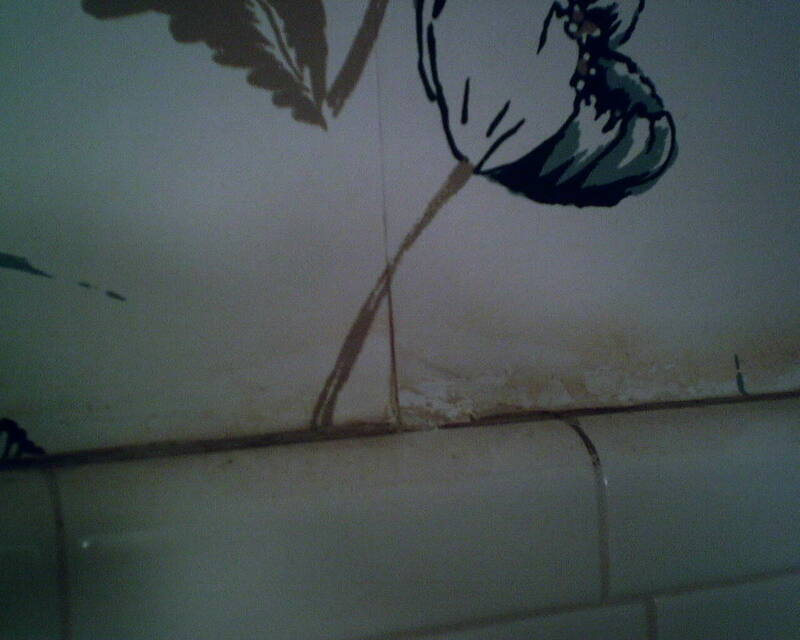 The second photo is a wonderful shot of the various surfaces you might find when stripping old wallpaper. First is the layer with the pattern and color. When that has been removed, you see the white (or sometimes yellow) paper backing. Once that backing has been removed, you are left with other sub-surfaces. 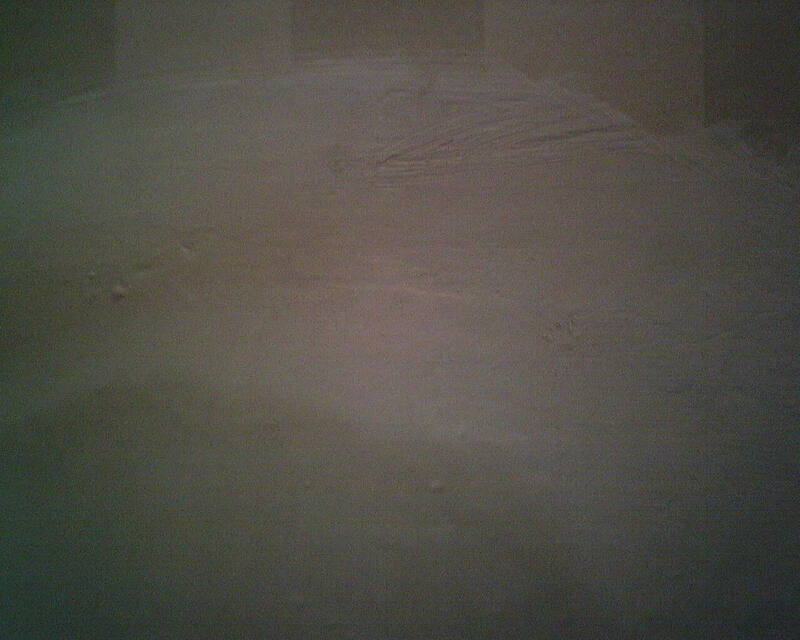 In the photo, the white is the areas that have been spread with “mud,” or joint compound, which is used over the tape that spans joints in the drywall. Another surface under the old wallpaper that is not shown in the photographs is paint, which you find where it has been oversprayed along the ceiling or next to where the woodwork was painted. The grey area is the top layer of the Sheetrock. Wallpaper will stick to all these materials differently – It sticks to paint “kind of,” but can be removed with no damage to the walls; it sticks to joint compound not really well at all, but removes easily also with no damage to the walls, but leaving a thirsty porous surface beneath; and when it comes to raw drywall, wallpaper actually bonds to the surface, and can be a bugger bear to remove. Usually, as in this case, pulling off the old wallpaper causes hairs on the unprimed drywall to pull up, so you end up with a gritty surface, which can leave bumps under the new wallpaper. Worse is when the top grey surface of the drywall de-laminates and pulls off, leaving the torn brown paper layer you see in the third photo. 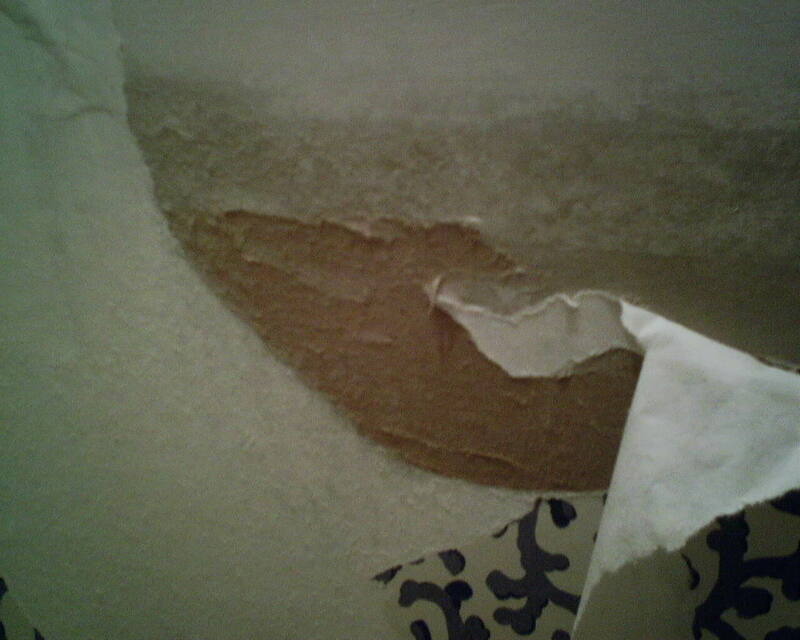 This is really bad, because, when hit with wet primer or wallpaper paste, this layer swells and likes to bubble up, leaving ugly bumps under the new wallpaper. The cure for this torn Sheetrock is to seal it with Gardz or a similar penetrating sealer / primer. Then the area needs to be “skim floated” with joint compound (similar to plaster), sanded smooth, wiped free of dust, and sealed again. All this takes a lot of time, eats up materials, makes a mess, and costs money. As you can see, it would be much better if the builder and / or original wallpaper installer would prime the walls before hanging the paper. Or, at the very least, not ideal, but at least it would protect the walls, if they would slap on a quick coat of paint. And, when it’s time to redecorate, it would sure make removing the paper a whole lot easier. Why Doesn’t the Pattern Match in the Corner? When you wrap wallpaper around an inside corner, you never wrap the whole strip, but rather cut the strip vertically so that just a tiny bit wraps around the corner, and then you overlap the next piece on top of that. This allows for undulations in the corner, keeps the paper tight in the corner, prevents puffed areas, permits you to re-plumb the new strip – but it also means that a tiny bit of the pattern will be lost, due to the overlapped area. In most cases, that overlap is minimal, and you don’t notice the lost pattern. But in this case, in the remodeled attic of an 80 year old home, the ceilings were not level, the walls were not plumb, and the corners were not even straight (meaning, some of them were bowed). The corner in the photograph was off by a good 1/2″ from the ceiling to the countertop. The 12″ wide strip I cut wrapped the corner a wee bit at the top of the wall, but by the time it reached down to the vanity top, almost half an inch was wrapping around the corner. 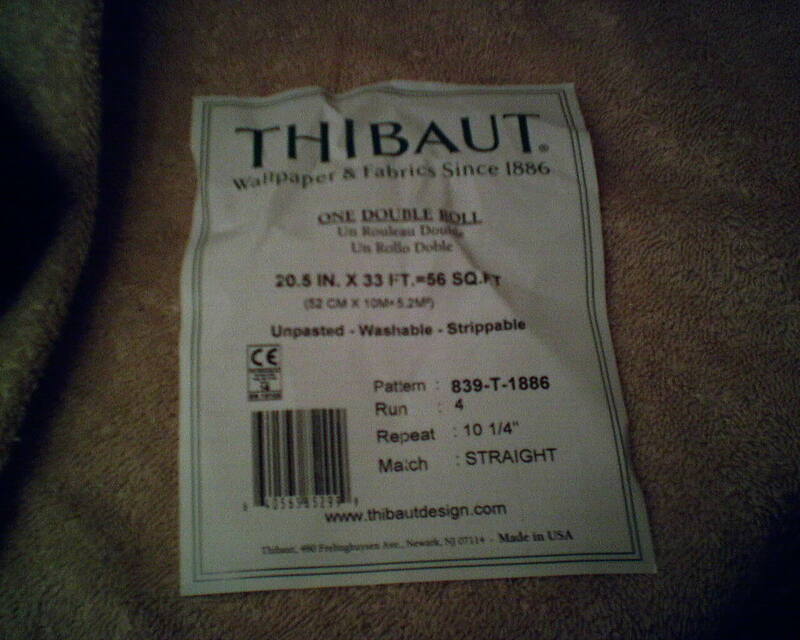 This means that that 1/2″ would be covered up by the subsequent strip – and that means that the pattern would be distorted, as you see in the photograph. I could have measured carefully and trimmed carefully, and cut the strip to fit the corner with minimal overlap. But that would have meant that the new strip of wallpaper would not be hanging true-to-plumb – and that would have meant that the motif at the ceiling and floor lines and along door jambs would be going crooked. So, you have to pick you poison. I decided that the pattern mis-match on this busy pattern was minor enough that it would not assault the eye, and I preferred it to the option of having the pattern go crooked at the ceiling and doors. The area on the left of the photo was covered with a mirror, and around the light switch a plastic switch plate cover had protected the wall. The rest of the walls were exposed to years and years of heavy cigarette smoking. 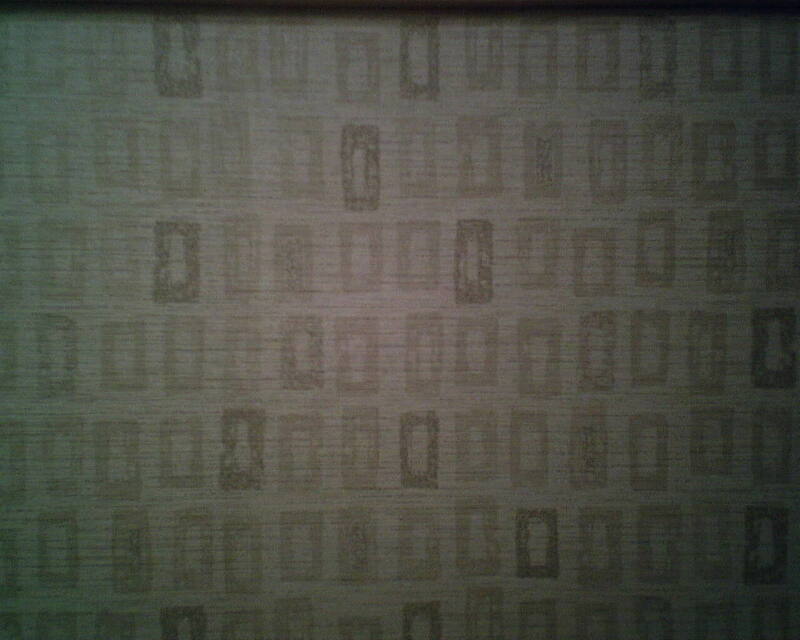 Just look at how that smoke has discolored the wallpaper! This 1963 ranch-style home in Meyerland (Houston), has seen a lot of structural damage due to the foundation shifting. Part of that is the “gumbo” soil we have here in Houston, and part is due to the major flooding that has plagued this neighborhood for decades. Cracks in the drywall are a common result of this shifting. This crack is wider than most, and it’s pretty long, too. The surfaces surrounding these cracks are level, which is good, but it’s unusual, because often the surfaces pull apart in two directions, leaving both a gap and uneven surfaces. 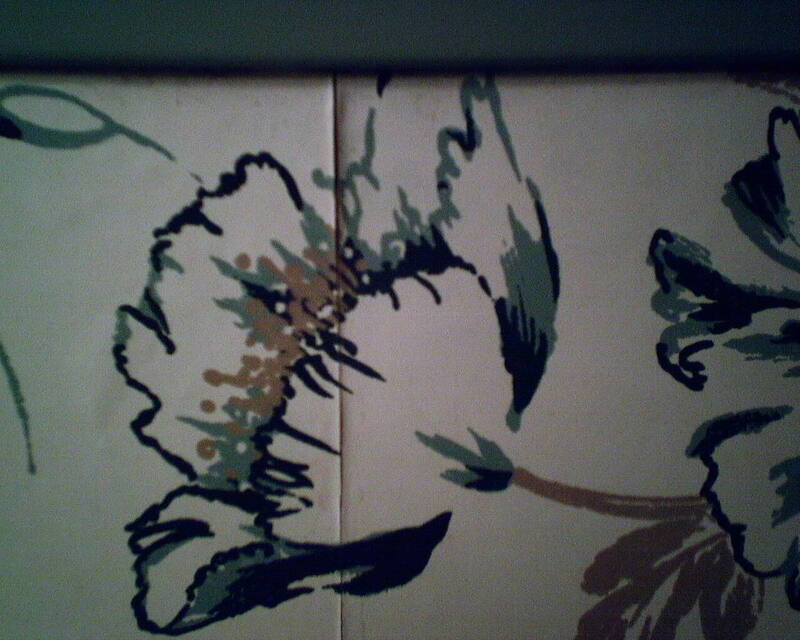 Wallpaper will cover the gap, but bumps and ridges might show under the paper. 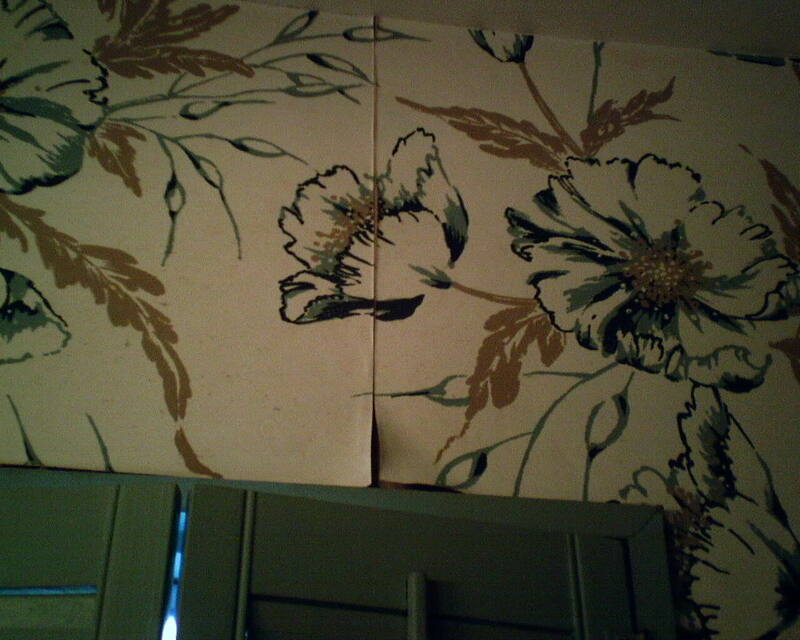 Also, if the foundation continues to shift (which, in Houston, is pretty expected), the wallpaper can tear and gap, too. So it’s a good idea to bridge the gap first, with something that can withstand shifting, or that will continue to bridge the gap and allow the wallpaper to “float” over it without tearing. The common repair for this is drywall tape and joint compound. But this process takes a long time to dry, and it leaves a noticeable bump on the wall, from the layers of tape and compound. So today I tried something different. I took paper drywall tape and soaked it in Gardz, a watery, penetrating surface sealer, and used the tape to cover the gap in the Sheetrock. It spanned the gap nicely, stuck tight, it dried nice and flat, with no bubbling, and was very thin. Because it was so thin, I only needed a light skim float coat of joint compound, to smooth away ridges that might show under the new wallpaper. Once that was dry, I sanded, and then applied another coat of Gardz. I was very pleased with how this turned out, and will keep it in my stash of tricks, in case another need arises. Have I Mentioned That I HATE Paper-Backed Solid Vinyl Wallpaper? Here are pictures of curling seams in a bathroom in a 1963 ranch style home in Meyerland (Houston). These older homes have low ceilings, poor air circulation, non-existent exhaust fans, and outdated air conditioning / heating systems. Which equals HUMIDITY. 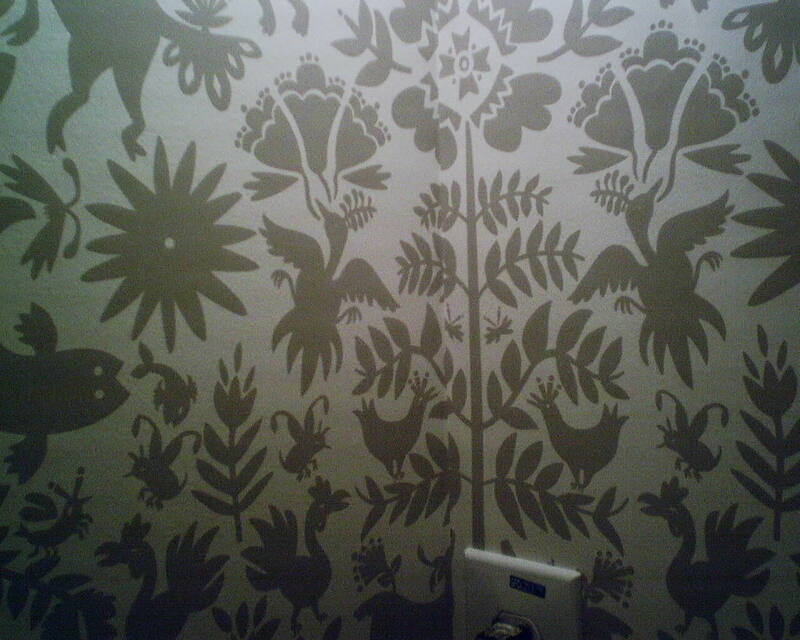 Humidity is the Great Enemy of wallpaper. But this home has other issues going on. 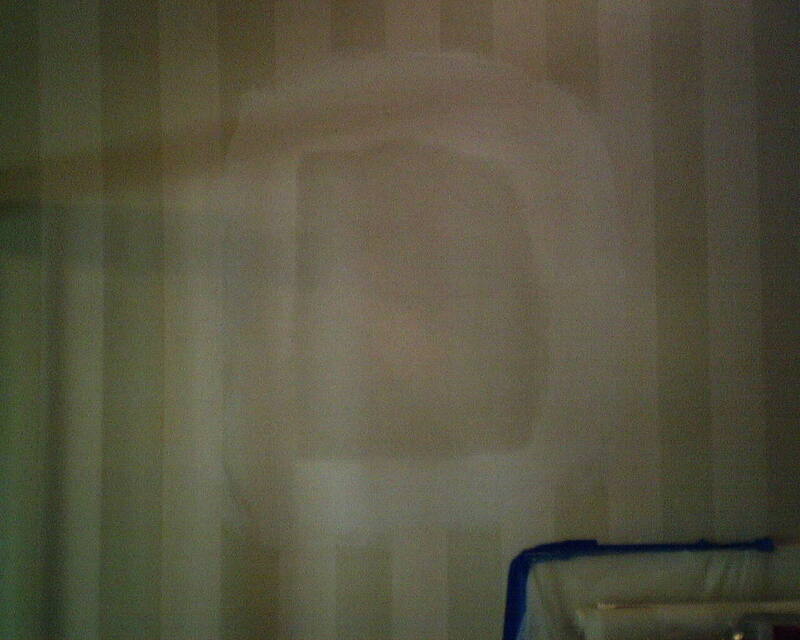 Besides the humidity and the delaminating, it looks as though the original installer did not properly prime the walls. It’s possible that his paste was not formulated to stand up against humidity. But more important, over the years, many things have been done to this room. And so we have layers of original oil-based paint covered with latex paint, and on top of that patches of joint compound, and more layers of various products … and at some point, these disparate materials cannot keep holding on to one another, and may pull apart – resulting in curling wallpaper seams. 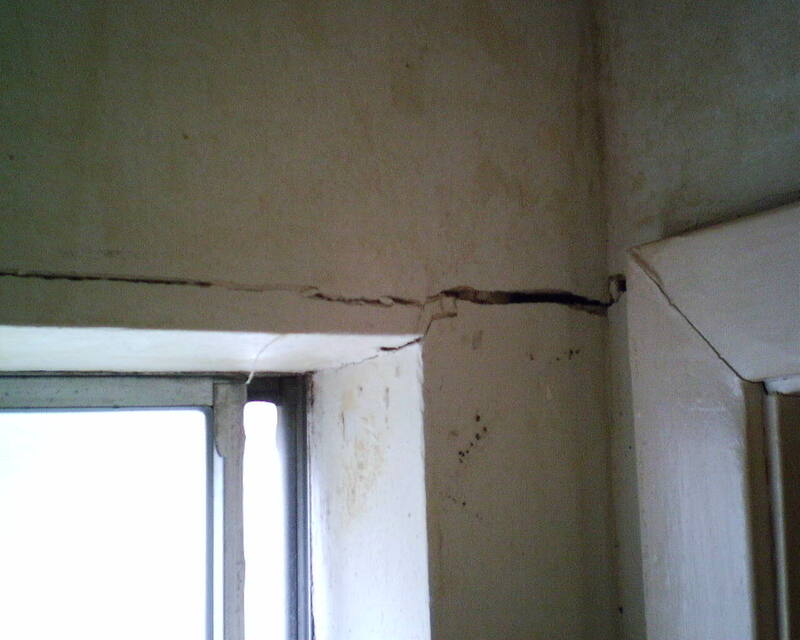 This room has also experienced water damage from a leaky window, and toilet, and roof. Water from those leaks got into the Sheetrock and deteriorated the internal structure, which became weak and then pulled apart. And when those internal layers pulled apart, the torque (stress) put on the walls by the drying wallpaper was enough to pull the layers of wall apart, and that can cause the wallpaper seams to curl. Curled seams are not always just about the subsurface, though. When pasted, many of these papers will have their paper backing swell, and when the front plastic layer does not swell, then you have seams that curl backwards even before you get to the wall. And once on the wall, the product can continue to curl. Sometimes these seams will dry flat. But many times, the seams don’t look as good as they should, plus are ripe for swelling / curling more, once a little humidity is introduced into the room. In my opinion, PAPER or the newer NON-WOVEN wallpapers, are better options. This wrinkled mess ran down the center of about 6′ of a bolt of wallpaper, definitely making it unusable. My guess is that it got caught up in the printing press somehow. 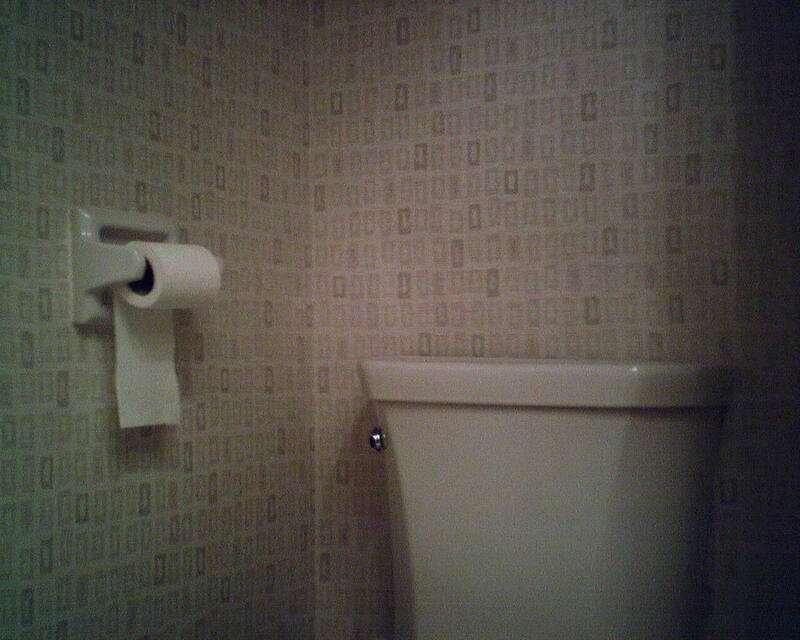 Luckily, I had the homeowner buy enough that I was able to discard this messed up paper, and still have enough to finish papering the powder room. This wallpaper is by Designer Wallpaper, by Seabrook. Doesn’t make sense, as 20-minute mud is supposed to dry in … 20 minutes; even a deep patch would be dry overnight. 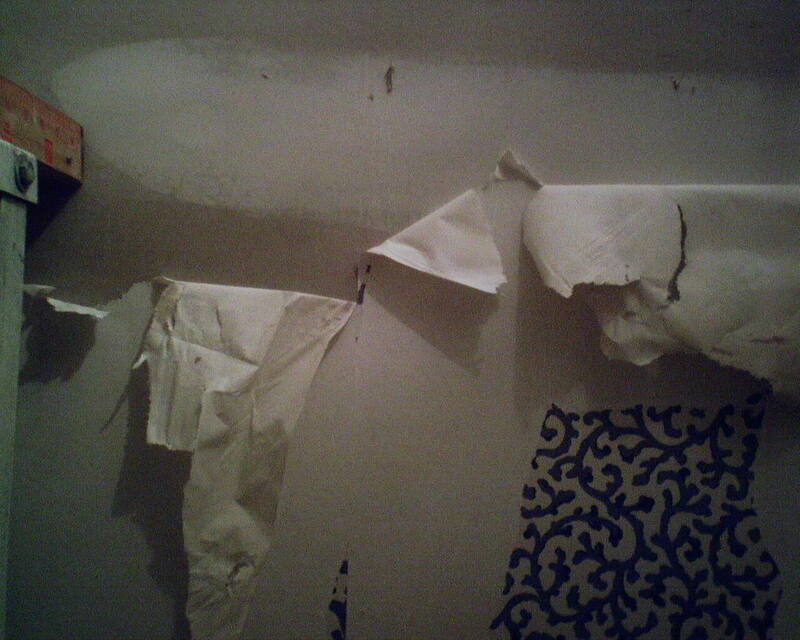 Anyway, I could not repair the wallpaper, because the patch was too wet to sand or seal with primer or hang paper on … too many potential problems. We will hope it dries sometime soon, and I can go back and make their wall look a little nicer. You are currently browsing the Wallpaperlady's Blog blog archives for December, 2015.